U.S. Continental men's road squad Team Smartstop will be upping its sights considerably for 2014, signing a number of experienced stage race riders, including Canadian road champion Zach Bell and Rob Britton. The team will also bring on Canada's Kristof Dahl (from H&R Block), who was a guest rider on the team for the Tour of Alberta. 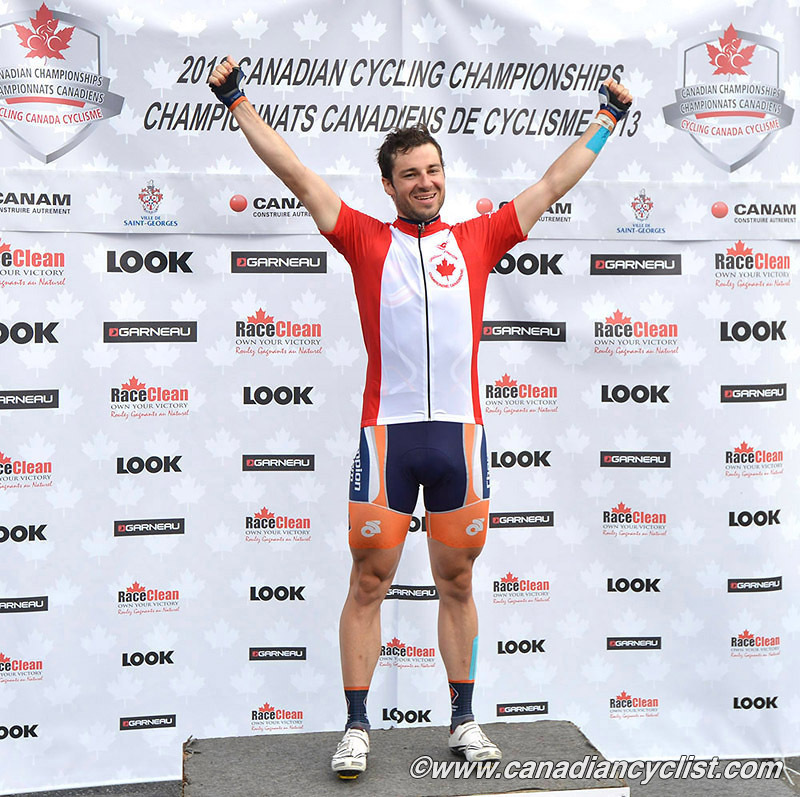 Former Canadian Criterium Champion, Ben Chaddock, has reportedly not been re-signed. Michael Creed, a former Pro Continental and ProTour rider, will become the team director. Until now, Team Smartstop has been primarily known as a criterium squad. The team has made no formal announcement of its 2014 roster, but Zach Bell confirmed that he has signed for the team and spoke with us from Vancouver. Canadian Cyclist: So my first question has to be about the sudden announcement that Champion Systems [the Pro Continental team Bell rode for this season] is folding. I'm assuming that this was a bit of a shock? Zach Bell: Yeah ... these things come and go, but they waited a fair amount of time to tell us what was going on. Throughout the year there was chit-chat about what was going on, sometimes it came up that it was not going on [continuing], and other times that it was going to be a bigger team ... so, there wasn't really a clear direction until they made the announcement. You heard it pretty much when we did. Yeah, it was a bit of a surprise, but these things happen. It would have been nice if they would have made their decision earlier, but I think they really did want to keep the team together. I think it really was a financial thing. CC: When you heard about it, that was fairly late to start looking for a team [late September]. Did you have any options or teams you were discussing with? ZB: I think their timing [Champion] put me in a bit of a race. I had some options before, and I was just waiting on what Champion Systems was going to say ... and they [other team options] went away in that time period. I was pretty confident that Champion Systems was going to look after me as one of their key guys. So that was pretty unfortunate, because those were good opportunities. With Champion Systems' timing, that was right when the flood hit [of unsigned riders], so all you could do was arrange to talk to every team that you could. I think I had some sort of correspondence with pretty much every director I knew, and a lot of other guys as well, just trying to find a spot. It took a bit of time, but I think there were just so many guys to wade through for a lot of teams that it was a tough job [for the teams] hiring guys. I think the teams are in a good situation, but it still wasn't easy. CC: Smartstop is a Continental team, not a Pro Continental team, so do have any idea what's going to happen with your race schedule? ZB: I think the the designation of Continental versus Pro Continental is going to look a lot different this year. Mainly because if you look across the North American race scene, it is full of guys that were Pro Continental and even WorldTour last year. And also with fewer team at those two levels [Pro Conti and WorldTour] I think there will be a lot more opportunities for Continental teams to step up into some big races. Obviously, our team [Smartstop] is a little more North American-based, but to be honest, Champion Systems had quite an extensive schedule in North America; I was just more a part of the other stuff. For me, I'm going to try and help the team get into some other stuff, some stuff that they haven't done, like racing in Asia - I think there are some good opportunities there ... there might be some stuff for us in South America. All to complement the schedule that is growing in North America. CC: Any particular races that you know of at this time that the team is going to be able to get into? ZB: I don't know anything for certain yet. I think that the races, just like the teams, are going have to decide what kind of teams they want in their races, because now a lot of the guys they have had at their races for years are going to be on smaller teams. Obviously, the team wants to make a big push to impress Medalist [Sports] at the beginning of the year so we can do some of their races, because they run the premier events in North America [Tour of California, Colorado, Utah, Alberta]. If we can do something to get into California, that's what we want to try and do. The ability to race in any of them is going to be positive for our team, I think we should be able to do it with the roster we have. We have guys who have performed at different levels all across the board, so hopefully we can just be consistent and show that we deserve to be there, because I think we have the roster to do it. CC: And for you, what about the track? The Milton velodrome opens later next year and then they have an International Challenge event. ZB: Well, I don't qualify for Worlds in 2014 because I didn't qualify for the World Cups [under the UCI rules of participation the year before], so that ship's sailed for me with the way the new regulations are. Next year isn't relevant for the Olympic cycling, so I'm still focussed on the road. Commonwealth Games on the track is the big one for me, and hopefully the road as well. It remains to be seen what that team [Commonwealth Games Road] looks like, but I have a spot for the track. I'm working with Craig and Ian [new national coaches] on how to be involved with them. I don't know yet what that's going to look like other than Commonwealth Games, but I'm anticipating that there will be some more opportunities, just because it will be closer to home for UCI races on the track. I think having a chance to work with some of the younger guys leading into Commonwealth Games will be good. I don't know what it will look like long term, but I want to race the Pan Ams on that [Milton] track; I'll put that out there! My performance on the road is going to be more crucial to the new team [Smartstop]; it's going to be on me to do a lot of the things the sponsors are looking for and just help get a lot of the other guys in position where they can do things as well. That's my primary focus [in 2014]. CC: When is the first time you will be getting together with the new team; any training camps planned yet? ZB: Loosely ... we're talking about sometime in January. Mike Creed is running the team now, so there's going to be a whole atmosphere change there in terms of the style in which the team's run. He's still putting things together and I don't know when and exactly where yet, but we'll come together, with the hopes of potentially doing some stage racing in South America or Asia before it starts to really pick up in California.